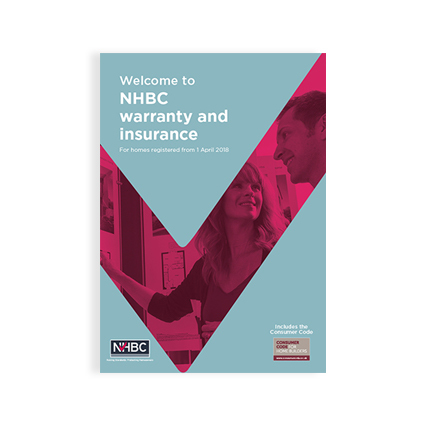 This NEW Welcome to NHBC warranty and insurance brochure replaces the Why buy this home? and Your guide to Buildmark documents for plots registered with us from 1 April 2018. Under the Insurance Distribution Directive (IDD) requirements, home buyers must be informed about their new home’s warranty and insurance cover as early as possible in the home buying process. The Welcome to NHBC warranty and insurance brochure must therefore be given to buyers at the point of reservation so that they are informed about the deposit protection cover that starts at exchange of contracts (or missives in Scotland). The new brochure provides a summary of our Buildmark warranty and insurance and includes a copy of the Consumer Code, helping you to comply with the Code requirements to inform buyers of their rights under the Consumer Code for Home Builders. You can order up to 50 hard copies below, or download a digital copy. For additional requests, please call 0344 633 1000 and ask for ‘Shop’.